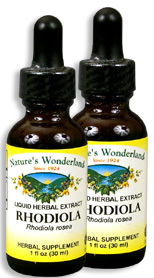 Rhodiola Liquid Extract, 1 fl oz / 30 ml each (Nature's Wonderland) - Penn Herb Co. Ltd. Maximize memory and reduce physical and mental stress with the Arctic Root, Rhodiola! The traditional herb from the Himalayas & Scandinavia delivers remarkable results for better work productivity and stress relief. Rhodiola is the intelligent choice to boost mental performance and productivity! Its unique compounds, rosavins, protect the nervous system from oxidative damage. This in turn, improves memory and relieves physical & emotional stress. NOTE: Find Rhodiola in our Kid’s Attention Plus and Mental Master liquid extract blends. AMOUNT PER SERVING (250mg/ml or 30 drops): Selectively Imported Rhodiola Root (Rhodiola rosea) Standardized to a minimum 5% rosavins. OTHER INGREDIENTS: Grain Alcohol (35-45% by volume), Deionized Water. Free of: milk, dairy, egg, fish, shellfish, tree nuts, peanuts, wheat, gluten or soy. Supports healthy memory and cognitive function; promotes mental clarity; fights effects of physical and mental stress; antioxidant; supports energy, stamina and endurance; promotes positive mood; improves sexual vitality; high altitude sickness. 30 drops in water or juice, 2-3 times daily or as needed. Shake well before using.